The yearly awards winners were announced by the Institute for Social Inventions last week in London. You know, for years the institute has collected innovative ideas for many kinds of social change. 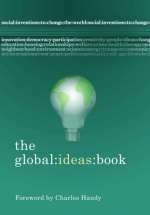 The ideas appear on the Global Ideas Bank website, and the best ones are published in at least one book every year. And of those, a few are chosen every year to get awards. And there's 1000 pounds for one of them. I just received the book of this year's ideas in the mail. And, well, we go way back. Not just because I was one of those awards winners quite a few years ago. But also because I was very involved in getting the website up originally, and getting the yearly ideas imported into it for years. And because Nicholas Albery who was the driving force behind the institute and the ideas bank became a good friend. Alas, he departed a little too soon, but good people are carrying on the institute, and clever and entertaining ideas are still streaming in. The £1,000 Overall Social Innovations Award for 2004 goes to Mahabir Pun, a teacher whose dedication and imagination has brought the internet and telecommunications to some of the remotest communities in the world in Nepal. Using an inspired mix of solar power, tree-based relay systems and wireless technology, the project is helping yak farmers stay in touch, families communicate and, with an expansion into distance learning, children to gain education. See NepalWireless.net for more information. Those are good projects and ideas. But if you think them a little too serious, check out some of the other clever and funny ideas in the bank that are maybe less likely to happen, like the suggestion to Miniaturise Humans by genetic engineering, in order to save greatly on our resource use. You know, if we were only 50cm tall, we'd consume 1/8 as much food, and would need much less room and smaller cars, etc. Makes a lot of sense, actually, but who's gonna start? There's a Global Ideas Blog too, passing on a lot of stimulating creativity. I had that idea after figuring god favored the smaller animals, you know after that giant incident with gods sons falling in love with our human women, lol. I found that a rain storm would be trouble if we were that short, I really like that idea though, and we could train june bugs for usefull stuff, we could ride our house cats, that would be fun, but they could eat us, lol. Anyway, I have lots of fun checking out the ideas bank, a great idea that seems to be working. I got an idea, why dont we get our leaders to tell the truth, level with us, um, come clean. If they just did that things would get a whole lot better world wide, see we just make them see thier greed, and ask them to be fair to everyone. I mean cant they make food free somehow, and medical, dental, transportation, communication, a warm place to sleep, proper sanitation, these things including water should all be no cost, doctors doing what they do because they like to help people. I know it can be done, maybe a machine that transmits health, food, that would be cool. Theres so much money being made by too few people, who are not understanding what they are doing. Its like losing a spicies of plant or animal, that something else more important survives on, so you just dont lose that 1 thing, you lose all that depended on it as well, just that one loss ends up takeing 200 or more with it. It dosnt take a rocket scientist to see this, and if our leaders are so great and smart then we should have no hunger, violents, sickness, these things would not exist, with out the greed that feeds them. Maybe someday though, or we will have solved those problems by replacing all the humans with robots, all they need is a little oil now and then.